This dreamy blanket scarf is perfect for the cool, chilly days of autumn. 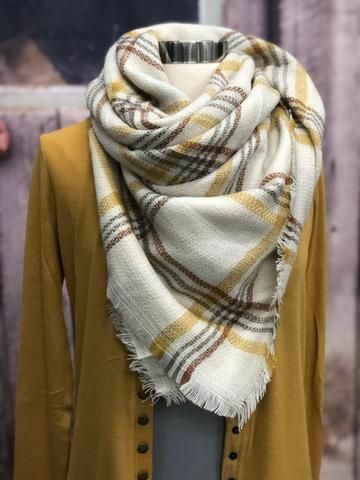 Rich cream and mustard colors make up this soft blanket scarf and is the perfect accessory for any outfit. Look and feel stylish while running errands, dropping the kids off for soccer practice, or simply taking an afternoon stroll through your neighborhood. Made of 100% acrylic; 55" square blanket scarf.